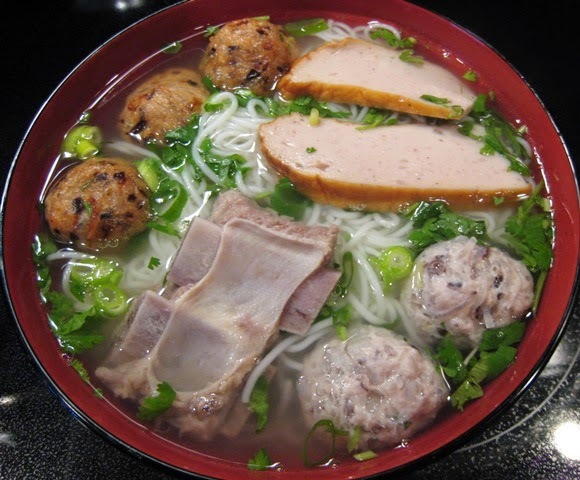 From many Vietnamese Food Recipes, one of my favourite dish is Moc Vermicelli Soup (Bun Moc). Came from the North Area of Vietnam, today it becomes popular around Vietnam, including Ho Chi Minh City. Serve dish when it is still hot and it will bring an amazing flavor in your mouth. Today, I will show you the way to cook one of stunning Vietnamese Food recipes. You can make this dish on weekends and enjoy with your friends and family. I am sure that they will love it. And here is the ingredients you need. Bean sprout, sliced banana flower, ong choy and vegetable. Seasoning: pepper, salt, sugar, garlic, vegetable oil and monosodium glutamate. Chicken: Clean it and wait to dry. Pork Chop: Clean in Cold water with a little salt, then put into basket and wait to dry. Grinded Pork (Gio Song): marinate a little pepper and monosodium glutamate. Black Fungus: Soak in water about 30 minutes, then slice them to small pieces. White Onion:Peel off the cover and slice it. 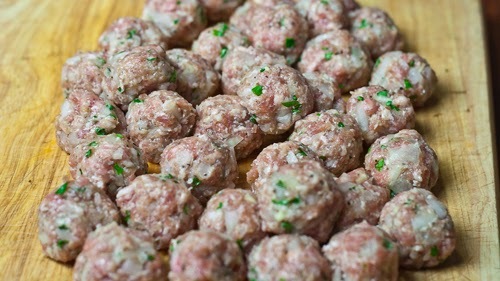 Vietnamese Pork sausage: slice to medium pieces. Shallot: Peel off the cover, slice and fry till its color turn yellow. Chili Paste: Mix with 3 tblsp oil + garlic + minced lemongrass (fry till its color turn yellow before) + annatto seeds + sugar + monosodium glutamate. Chili Powder: Mix with a little fish sauce + monosodium glutamate. Then mix with mixture of chili paste above. Parsley, Spring Onion, Lemon, Chili: Slice them. All kinds of vegetable: Wash in cold water with a little lemon juice or vinegar. Then throw away water and wait to dry. Vermicelli: Wash in Hot water and wait to dry. Garlic: minced it and fry with oil till its color turn yellow. Step 1: Use spoon to scoop each grinded pork and roll to circle shape (you can add a little salt + sugar and sliced spring onion before making this step). Then add a little sliced black fugus around it. Next, put it into hot water, cook about 5 minutes and put it out immediately. When serving, you add some grinded pork rolls on the face of vermicelli. -If you love fried food, instead of boiling it, you can fry grinded pork rolls. Or you can choose both ways to making this step. Step 2: Making Broth: Boil 2,5 liter cold water + a little salt + sugar + sliced white onion. Wait till the water get hot, add pork chop + chicken into pot with medium heat. Like many other Vietnamese Food recipes, with this step, do not cover the pot, the broth will turn blur and look not delicious. Cook about 45 – 60 minutes and put chicken and pork chop out of broth. Taste broth again to suit with your flavor. -From my experiences, if you want to keep the chiken meat color still white, after put it out of pot, put it immediately into cold water about 3 minute. And then you tear chicken meat to small pieces. Finally, you finish Moc Vermicelli Soup recipe. Next, I will show you the way to serve it. Put a little vermicelli into bowl, add chicken + pork chop + grinded pork rolls (fried or boiled, it depends on you) + pepper + parsley + spring onion + fried shallot + persicaria leave. Next, pour hot broth into bowl and you can serve it now. 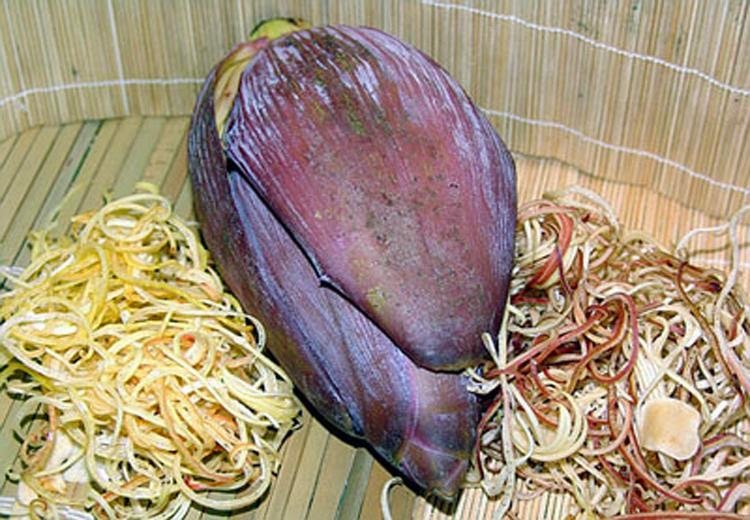 Moreover, you should use this dish with Shrimp Paste, lemon juice, chili, bean sprout, sliced banana flower, ong choy, fish sauce and chili paste. I hope you like this recipe. 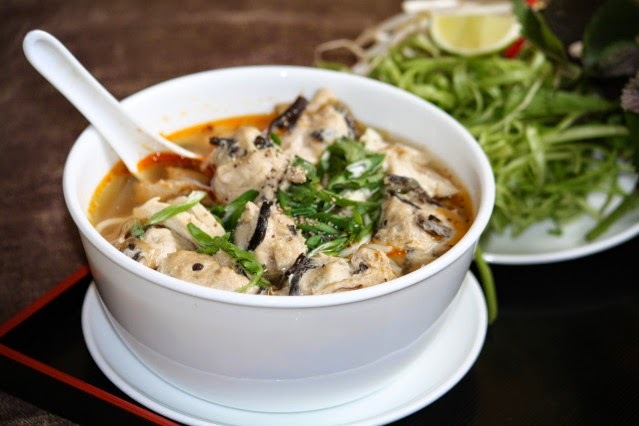 And do not miss our next posts, it is all about Vietnamese Food recipes for you. Good Luck.